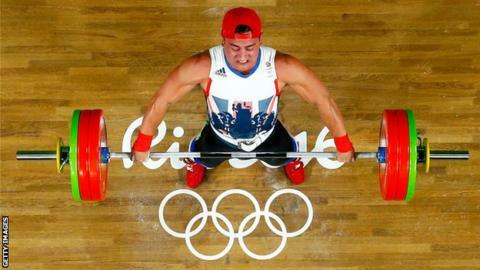 Rio 2016 British weightlifter Sonny Webster has admitted defeat after spending his life savings in an attempt to overturn a four-year doping ban. Four months ago, an out-of-competition test showed trace amounts of ostarine - which is used to treat osteoporosis. Webster, 23, has twice since rejected offers to halve the punishment by pleading guilty, insisting he does not know how it got into his system. "I was prepared to do everything in my power to prove the truth," he said. "I was never going to admit to something that I had not done intentionally, regardless of the consequences." Webster was the only British competitor in the men's weightlifting at the Rio Olympics, and finished 14th in the 94kg category. He was fifth when competing for England at the 2014 Commonwealth Games in Glasgow. The Rotherham-born lifter revealed on Monday in a Facebook post that he had tested positive - news he described as a "complete shock". Furthermore, the test came outside the one-hour window that an athlete must provide each day in which they can be tested under the whereabouts system. "That means had I not answered the door then there would not have been any consequences," said Webster, who estimates he has done nearly 50 tests in the past seven years. "But I take pride in the fact that I get drug tested. It is important for me as I like everyone to know everything I have achieved is down to hard work. "As I had nothing to hide, I was happy to welcome the testers into my home and perform my drugs test as I always have been. "Weightlifting is my life and everything that I live and breathe and I would never risk losing this by knowingly taking a banned substance." Webster's four-year ban is the most penal sanction available for drugs use in weightlifting - something he says if "wholly unjustified" given the circumstances. He points to the fact he engaged lawyers and scientists to analyse the samples and supplements establish the source of the banned substance. The lifter was offered a reduced ban if he pleaded guilty to knowingly having taken the substance but refused, and railed against the "injustice" of the system. "You may think that that was a stupid offer not to take, but I was prepared to do everything in my power to prove the truth," Webster said. "This whole experience has highlighted that my integrity is worth far more than any amount of money. "I have spent my life savings in my attempt to find out how ostarine came to be in my sample and it has been really difficult to deal with, having been through all of this and to still not know the cause."